The “Graco Pack 'n Play Playard On the Go with Folding Feet, Circus Time” is a wonderful tool for parents at home or on the go! It's colors are festive and unisex. A removable toy bag snaps onto the end of the play pen. 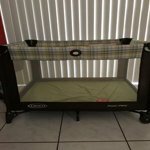 The easy breakdown and the carry bag that came with the Graco Pack 'n Play Playard makes for an easy transition from home to travel need. Simply push a button on each rail and it folds up in a jiffy. Simply place in it's carry bag and it is ready to throw in the family vehicle to take the tyke anywhere you need to travel. The Pack 'n Play Playard seems to be built in a very sturdy fashion. It should serve for any child, be it a newborn to a larger toddler. Even if you are not an “on the go” family, these are wonderful things to have to put your child in when you need to get some house work done and it would be impossible to watch the child otherwise. 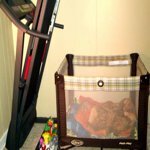 You may say that “I can put them in their crib.” It is never wise to confuse a child by putting it in the crib to play or for “time out” punishment. The crib should be for sleeping only. This is why I would recommend the “Graco Circus Time Playard ” as a reasonably priced tool for your baby or toddler to play in or to face the music for their actions. This playpen is super adorable! What I liked most is that it can really be for a boy or girl so if you're looking for a gift that is probably on every parent-to-be's list, this would be a great gift with a great bargain price! In my opinion, as a parent, you really can't have enough of these. Stick one in the car, one at grandma's etc and you won't ever have to worry! 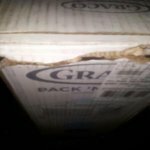 I have always purchased Graco's and they last and last, in fact I've never thrown away a playpen. You can clean them and years later when you no longer need it, you can donate it a Salvation Army. These things last and last. Circus Time is (as the name implies) a cute circus theme that any child is sure to love. I placed my son in it and he was thrilled and didn't want to get out! Translated, he described it as very comfortable lol. My favorite part is that it has wheels on one end which is so great for trying to move it around and since it's just on one side, it makes it safe from being accidentally rolled while your child is in there. 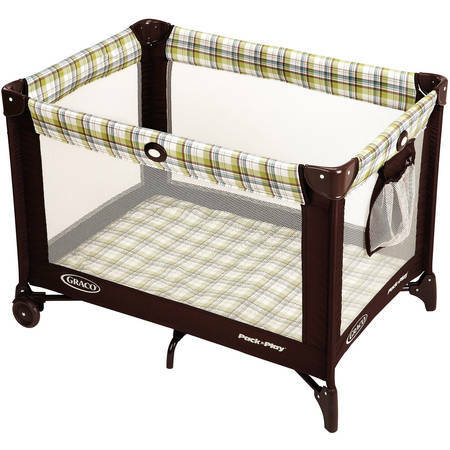 It does come with a handle for easy transport, I can't rave enough about this playpen! Enjoy! 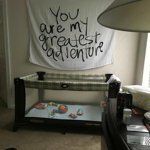 I absolutely loved using The Pack N' Play Portable Playard by Graco. The fact that there is absolutely NO assembly required in order to use this product is such an added bonus. This product is truly a breeze to setup... You just pull the playard out of the box, unsnap the cover that the playard is incased in, which also serves as the padding for the playard. Unfold, press the bottom of the playard down , add the padding and it's ready for use. Breaking down the playard is just as easy. The Playard has a cute little Circus time theme and comes with it's own travel case, which makes it convenient to carry when traveling or storing. The playards comes with a storage bag which snaps onto the side of the playard which I found to be a little difficult to do, but once I got it snapped on it stayed in place. 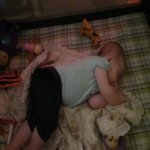 Also,When I layed my granddaughter down for a nap, I did have to add extra padding to the bottom of the playard as I found the padding to be somewhat lacking in comfort when used for napping. The Playard's compact size is great if you have limited space. The two intergrated wheels on the playard makes it easy to move the playyard to different areas should you need to. I truly love using this budget friendly product and would definitely recommend it to others. Perfect little Playard for use in my daycare. The baby loves playing in this safe environment and has even taken a nap in it. I bought this play pen as a back up. I needed some place safe to place my 8 month old while I showered. This fits the bill. Cute colors. I purchased a sheet in case he spits up for easier cleanup. The only con I have is the mattress is flimsy. I have to buy the thicker play pen mattress because when I put him in I can feel the mattress bow or sink in so it isn't flat when he's in it. The Graco Pack 'n Play Playard On the Go with Folding Feet, Circus Time is the perfect companion for your little one. It easily caters to babies up to 35" tall and weighing up to 30 lbs. The Playard measures 39"X28"X24". It's convenience in a bag. The Graco Playard snaps and locks into place and is quick and easy set up and tear down. The secret of that is READ THE DIRECTIONS before you attempt to set it up. My husband worked himself into a frenzy trying to set it up without reading the directions first. It just was not happening. As soon as he gave up and read the directions, it was as easy and one, two, three. The wheels add an extra level of convenience. It also come with a small carrying bag that snaps into place on the outside of the Playard. The breathable mesh panels keep your baby cool and comfortable. It also comes with a good padded mattress pad for the baby. The circus theme print is cute and colorful. It is perfect for either gender. It is surprisingly sturdy for a portable playpen. I believe it could use more padding along the top bars, but overall it is a good, sturdy Travel Playard. You will get loads of use out of it. This is a very convenient play yard which comes with a carrying bag for travel and storage. It has automatic folding feet and wheels that make it easy to use. It comes with a toy bar with soft toys. I am a Grandma and this play yard also serves as a second infant/toddler bed at my house. Overall, the assembly took about 10 minutes. The Circus theme is so cute - it would go with any décor and the quality is great. The play yard is sturdy, and I expect that it will last through a couple of more grand-kids. I recommend this. I was pleased with the appearance of thus product. It seems to be strudy,but it has not been used yet. The colors are excellent and will go well in the baby's room. I do, however have a complaint as to the damage to the carton,when delivered by UPS. The carton was torn as if busted when dropped. We could not if d any parts missing or damage, yet.